Jeff is the Executive Director of First Community Housing in San Jose. He is also a long-time resident of Santa Cruz County and is now bringing award-winning, mixed-use, transit-oriented, community-centered, environmentally sustainable projects to our side of the hill. With over 1,500 units developed, he has the experience to do it right. If you missed him at West Coast Green in San Francisco, you can see him right here. This event is sponsored by Ausonio Incorporated. 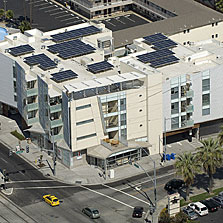 "Strategies for High-density Green Affordable Housing"